Do you have a &#8216;Rurban&#8217; in you? 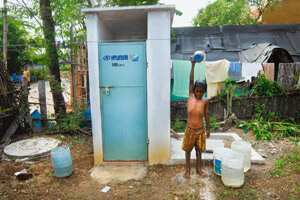 Clean sweep: Hyundai Motor India is constructing 200 toilets in Irungattukottai village, near Chennai. Photo by Nathan G/Mint. Do you have a ‘Rurban’ in you? For the financially secure, urban Indian, however well meaning, rural India remains a nebulous construct. We know the statistics, hear about farmer suicides and watch verdant paddy fields in movies. But barring annual visits to ancestral villages, few urban dwellers have any real intersection with Mahatma Gandhi’s “700,000 villages", now about 640,000 as per Census 2011. We don’t know how our rural counterparts live and what issues they grapple with. Then how to contribute? Where to begin? Ramesh laughed and said that his top priorities, such as land reform, rural infrastructure and employment, were not things the average citizen could contribute to. “Those initiatives are for well-meaning bankrupt governments, not for well-meaning rich individuals (like your readers)," he said. “The bulk of investments in rural areas will have to come from the government. To expect the private sector to make these huge investments is unrealistic." I can see why he thinks that; but with all due respect, I disagree with him. The 2011 Bain & Co. report on philanthropy in India states that private giving in India is between 0.3% and 0.4% of GDP —higher than other developing countries such as China, but far lower than America’s 2.2% and the UK’s 1.3%. The reason for this disparity is because individual donations in India only constitute 26% of all private giving, relative to the US’ 75% and the UK’s 60%. We look to our governments for the bulk of funding, particularly in rural India, where the government has budgeted ₹ 74,100 crore for 2011-12, according to the ministry of rural development (MRD) website. The question is: Can a charismatic leader like Ramesh cause a significant shift upward in private donation numbers so that “bankrupt governments" can spend less? Say, I want to find a rural cause. I know two catalyst organizations—EdelGive and Caring Friends, both in Mumbai. I would call them up and ask them to recommend an NGO. I would make a one-time, ad hoc donation, just to feel good. Ramesh suggests the opposite. “The problem with NGOs is that they lack scale and are dependent on personalities," he says. “Urban Indians can help through technology and expertise. They could make a firm five-year commitment to the right NGO so that they can build capacity." Today, while folding clothes, I listened to a podcast interview with productivity guru Robert Pozen. Strange juxtaposition, I know. Pozen teaches at Harvard Business School, ran a fund company with $200 billion (around ₹ 9.8 trillion) in assets, and is a fellow at the Washington-based think tank, Brookings Institution. Pozen described leaders who took on too much, simply because they believed that they were the best for the job. “The question is not who’s best at performing high-priority functions, but which things can you and only you as the CEO get done?" he asked. As soon as he said that, I wondered if I should stop folding clothes and tackle those jobs that I and only I could do. I am oversimplifying of course, but this begs the question: Is the MRD taking on too much? What are the high-priority functions that Ramesh and only Ramesh can do? Everything else, he can outsource to corporations, foundations and individuals. Easier said than done, I know. The roadmap to citizen involvement is circuitous and fraught with hurdles. I am not talking about public-private partnerships such as those initiated in the healthcare sector in Karnataka, Andhra Pradesh or Uttarakhand. I am talking game-changer, a la Steve Jobs. If anyone can do it, a maverick like Ramesh can. The MRD has 11 schemes in its portfolio, including training and housing. Ramesh also oversees drinking water supply and land resources, each with several schemes. The extent of his duties and projects are mind-boggling. No wonder he is in Gumla on a Saturday night. After some back and forth, I pushed him for names and organizations he could recommend. “Canvass opinion from credible people who have experience in this area—people like Aruna Roy, Joe Madiath, Al Fernandez, for example—and also from administrators who have worked with such NGOs (S.M. Vijayanand in Kerala, K. Raju in Andhra Pradesh, Santhosh Mathew in Bihar, for instance). Once you find a good grassroots NGO—like Gram Vikas in Orissa—you contribute." Ramesh’s solution for individual contribution to rural India is practical but not a paradigm shift. He should expect more from us, I say. Bangalore citizen, author and philanthropist Rohini Nilekani has just released a book called Uncommon Ground. Urban and rural India can find common ground, can they not? Ramesh calls it “rurban". “Frankly, the notion of rural and urban India is an old concept," he says. “These are not two boxes, not two silos. There is a continuum. India is increasingly getting rurban. That’s where the real growth is taking place." Could he name one area where individual contribution would make a difference? His answer is surprising: toilets. “To my mind, the single biggest issue that we face is sanitation," he says. “Fifty-eight per cent of all open defecations in the world are in India. Fifty to seventy-five per cent of all Indian women defecate openly. It is a national shame, a national blot. We are trying to entice people to use toilets. We have built lakhs of toilets but people aren’t using them. We are trying to start a major Clean India campaign; communication programmes and such." Hallelujah! I find my answer. Ramesh has opened the proverbial Pandora’s box. My fellow urban Indians! We may not be able or willing to spend extended amounts of time and energy in our villages, but we can do a Clean India campaign. Influencing minds is urban India’s forte. We have copywriters, ad geniuses, celebrities, Bollywood stars. What if Sachin Tendulkar, Deepika Padukone, A.R. Rahman or Savita Bhabhi urge people to use garbage bins or even toilets? They might listen. Shah Rukh Khan has already agreed to be an advocate for sanitation and hygiene. He has become the ambassador of the UN-hosted Water Supply and Sanitation Collaborative Council (WSSCC), and has called for “political commitment at the highest level". Khan’s first public service announcement is in English and on YouTube, where it will reach exactly those people who don’t need to squat on the streets. Someone should get him to speak in Hindi and beam him to India’s hinterlands through mobile phones, which have the greatest penetration in rural India. This is blue sky thinking, but maybe Sunil Bharti Mittal could have his engineers design an annoying phone alarm that goes off every time someone decides to take a you-know-what under the blue sky. NGOs like Sulabh are already doing good work on the ground. The UN has jumped in. Kerala member of Parliament Shashi Tharoor’s wife, Sunanda, wants to build toilets for girls. There is a confluence of ideas on the verge of a tipping point. About time too. I asked Ramesh for contact details I could publish in case Mint’s readers wanted to get involved with the Clean India campaign or his ministry. He gave me his email: jairam54@gmail.com. If you write, tell him Mint sent you. And please don’t spam him. Shoba Narayan is part of several Clean Bengaluru initiatives.